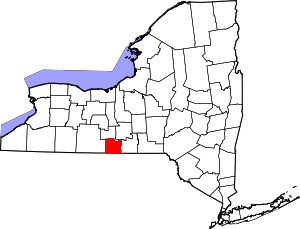 This is intended to be a complete list of properties and districts listed on the National Register of Historic Places in Chemung County, New York. The locations of National Register properties and districts (at least for all showing latitude and longitude coordinates below) may be seen in a map by clicking on "Map of all coordinates". One site, the Newtown Battlefield, is further designated a National Historic Landmark. Buildings at 104-116 West Water St.
(#08001230) 104-116 W. Water St.
(#78001844) 415 E. Water St.
(#71000531) 210-228 Lake St., between Market and E. Church Sts. (#08000449) Old NY 17 at Lowman Rd. (#96001442) 312 W. Broad St.
(#15000308) 505-605 College Ave., 300-431 W. Clinton, 608-612 Columbia, 348-354 W. 4th & 513-602 Davis Sts. (#13000778) 62 Soaring Hill Dr.
(#80002596) E. Church, Lake, E. Market, Baldwin, Carroll, and State Sts. (#97000423) 415 W. 2nd St.
(#84002068) Roughly bounded by College and W. Washington Aves., N. Main St. and Park Pl. (#82003349) 268 E. 14th St.
(#82001094) Jct. of E. and W. Franklin and N. and S. Main Sts. (#80002597) Grand Central Ave., Fletcher, Sayre, W. Mill and Center Sts. (#84002069) 79-105 Pennsylvania Ave., 50 Pennsylvania Ave.
(#100001244) 226 S. Main & 204-206 W. Henry Sts. (#83003906) Roughly bounded by Chemung River, College Ave., 2nd and Hoffman Sts. (#16000015) 100-184 N. Main & 200-233 W. Water Sts. (#77000936) 208 W. Gray St.
(#100001622) 408 S. Main St.
(#83003907) Steuben, Pine, and W. Main Sts. (#07001122) 304 N. Main St.
(#100000480) 430 W. Washington Ave.
(#04001117) Walnut and Davis Sts., West Hill and Bancroft Rds. 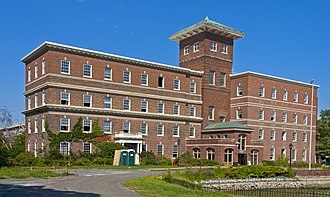 Wikimedia Commons has media related to National Register of Historic Places in Chemung County, New York.